Has this ever happened to you? You bite down on something a little too hard and you feel it. A cracked tooth. It’s the worst and it can hurt a lot. In fact, it can prevent you from being able to chew at all. This is a dental emergency and something you should definitely call your dentist about right away. Even if you can’t see the crack, it might be what’s causing your pain and even your sensitivity to hot and cold. There are several steps to take in determining what is the best course of action for you. The first step is to determine which type of crack you have so we can suggest a treatment option that will work best for you. Craze Lines – These are itty-bitty cracks that really only appear on the enamel. They’re very common, and generally, they go unnoticed. If you can see them, we might suggest a whitening treatment to remove any staining or discoloration in the crack itself. Fractured Cusp – These cracks often happen around fillings. It doesn’t normally cause pain, and we will often suggest a new filling or sometimes a crown to protect the damaged tooth. We don’t want this crack to get bigger and cause more serious issues down the road! 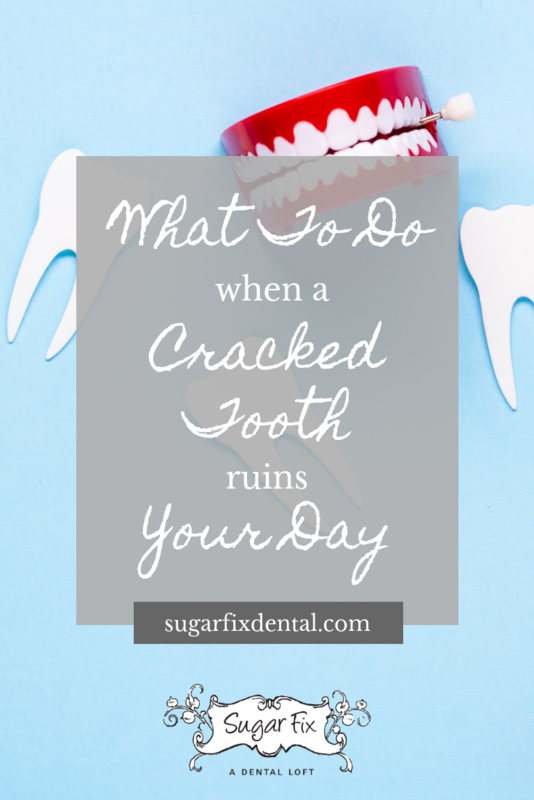 Cracked Tooth – A fully cracked tooth means a you have a crack that starts at the bottom of your tooth and extends upwards or downwards toward the root. These cracks can spread if they go untreated, so we often suggest either a root canal and crown or a full extraction, depending on whether the crack extends beyond the gum line. Split Tooth – This is what often what happens when a cracked tooth is ignored for too long. A tooth that is split usually cannot be saved and will have to be extracted. In this case, we can do an implant and get you a brand new tooth that perfectly matches the rest of your smile. Vertical Root Fracture – These cracks are a little unusual in that they start at the root and travel toward the tip of the tooth. Unfortunately, your dentist will be the first to notice this type of crack, and by that point, it may be too late. If it’s causing a gum infection or other issue, all or part of the tooth may need to be extracted. This is why it is so important to schedule regular checkups! How Do I Prevent Future Cracks? The best thing you can do is be proactive when it comes to keeping your teeth healthy. This is true across the board, but especially when we’re talking about cracked teeth. You’ve heard it a thousand times, but resist the urge to chew on things like ice, hard candy, or unpopped popcorn kernels, and DO NOT use your teeth as tools. If you grind your teeth, talk to your dentist about getting a mouthguard to keep your mouth happy and healthy and always remember to wear a mouthguard if you’re playing contact sports. If you have any questions about cracks or chips on your teeth, do not hesitate to reach out to the Sugar Fix Dental Loft team! You can reach us at 773-883-1818 or you can schedule a consultation or appointment on our website by clicking here!